Northmont’s medal recipients and coaches, front row, left to right: Justin Parrett, Justin DeLano, Bobby Gaylor, and Josiah English. Second row, left to right: Jonah Mergler, Coach Delaney Schreiber, Eric Woods, Mitchell Asbury, and Coach Maria Schreiber. 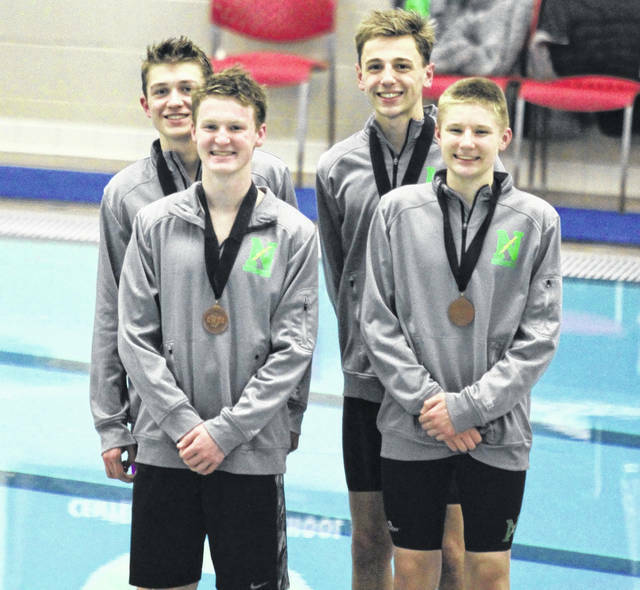 Northmont’s 200 yard medley relay team of Josiah English, Bobby Gaylor, Justin Parrett, and Justin DeLano (left to right, front row then back) placed fifth. 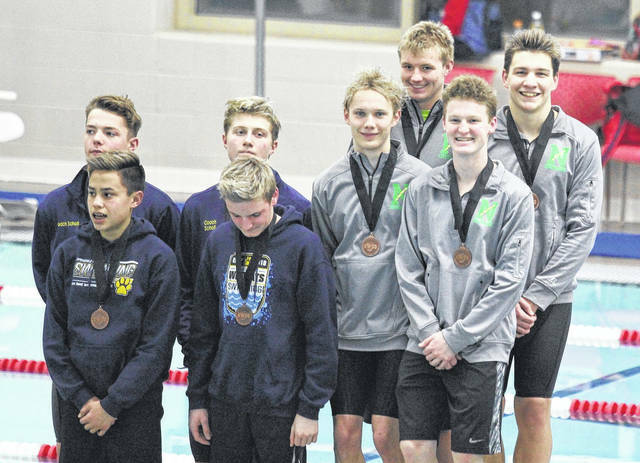 Northmont’s 400 yard freestyle relay of (front row) Bobby Gaylor and Jonah Mergler and (back row) Mitchell Asbury, and Eric Woods placed 8th. 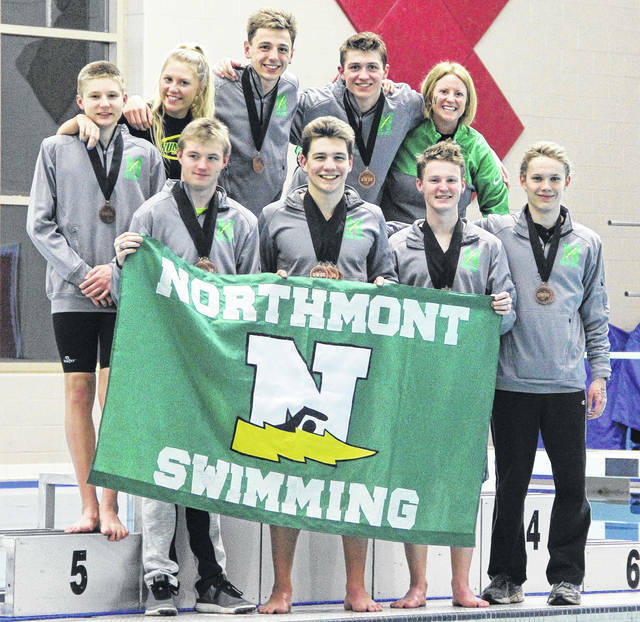 TROTWOOD — On February 1, several Northmont swimmers participated in the GWOC All-Conference meet, held at Trotwood-Madison High School. Participants had to place in the top 16 swimmers of their event at the GWOC District meet, held on January 27, in order to be eligible to compete in the All-Conference meet. Seniors Justin DeLano and Justin Parrett both placed in the top eight in their individual events. DeLano took third in both the 100 yard butterfly and the 100 yard backstroke. Parrett placed fifth in the 200 yard freestyle and sixth in the 100 yard breaststroke. Northmont’s boys relay teams also finished in the top eight in their races. The team of Justin DeLano, Justin Parrett, Josiah English, and Bobby Gaylor placed fifth in the 200 yard medley relay and sixth in the 200 yard freestyle relay. The relay team of Mitchell Asbury, Eric Woods, Jonah Mergler, and Bobby Gaylor placed eighth in the 400 yard freestyle relay. Overall, Northmont’s boys’ team placed seventh out of 20 teams in the conference. For the girls, Fynn Roberts finished 11th in the 100 yard breaststroke. The girls’ 200 yard medley relay and 200 yard freestyle relays both placed 13th, while the 400 yard freestyle relay placed 12th.